Go Off-Grid with solar PV and keep your lights on when the neighbourhood goes dark! Solacity can help you with the sizing, design, and parts for a quality Off-Grid DIY system. Off-Grid power solutions can be appealing for multiple reasons: Maybe your home does not have access to (or it is very expensive to connect to) grid electricity. Or you want to be very green and become your own power company. Possibly you want to have nothing to do with your local power company. Or you like to keep your lights on when everyone else’s go out. All good reasons to go Off-Grid! What does living off the grid mean? The term grid refers to the main utilities such as water, electricity and gas. Most people live “on the grid” meaning they depend on these main utilities to survive. Living Off-Grid means you no longer depend on those. Off-Grid systems offer complete autonomy and independence from the regional electrical grid. Energy is stored in batteries for use at night and other times when the solar panels are not generating as much electricity as you require. Being off the grid does not mean you have to sacrifice your life-style: An off-grid system can be sized to suit any need, if cost is no issue, from cottage to country-home! Why Go Off-Grid & Make Your Own Power? There are as many reasons to make your own electricity and go off the grid as there are people doing this. Quite often it is not a single one, but a combination of many reasons where each individual one is not swinging the balance, while all together they do. Making your own power is definitely greener than buying it from your local utility. Solar panels can be recycled, and the lead-acid batteries that are generally used for an Off-Grid installation are one of the most recycled products in the world. No fossil-fuels are burned when making solar electricity; PV modules do that in silence, with zero maintenance, for 30+ years. Despite the expense of an Off-Grid installation it can actually be the most economical solution in some situations: We have helped a number of customers go off the grid after the home owners received an estimate from their local utility in excess of $100,000 to get connected to the grid. In those cases going Off-Grid paid for itself from day one. We have also had home-owners that did not want to have anything to do with their utility company, despite having a line running right along their street. They choose to be Off-Grid, and are happy to pay the premium that comes with it. Sometimes it is just life-style where people want to live as independently as they can, even if the grid is available. Not every system has to be an elaborate whole-house Off-Grid installation of course. You can also install a few panels with a small inverter for a cottage; to run (for example) a few lights, a well-pump, and a TV. Having power (without the constant noise of a generator) can make your weekends at the cottage that much more pleasant, without breaking the bank. For those smaller systems have a look at our Cottage Kits. Being Off-Grid does have one BIG advantage: When the next ice-storm hits your lights stay on! Want To Get Rid Of Hydro? It is no problem to go Off-Grid, and these days of relatively cheap solar panels it does not even require much of a change in life-style. Batteries are expensive though, and every off-grid installation needs them. They are needed to get through the night, when the sun doesn’t shine, and for those long periods in winter when it is too dark to generate much. Batteries are a consumable; they need to be replaced every so many years (for the Rolls/Surrette lead-acid batteries that we sell most for off-grid use that means every 10 to 12 years if they are treated well). It is those batteries that make Off-Grid electricity expensive. This higher electricity price should be taken in context though: Most people that live Off-Grid use much less of it than the average grid-tied family. That brings actual costs much more in line between on- and Off-Grid electricity. The average Canadian household uses 1000 kWh per month. Compare that to the average Off-Grid family that uses around 150 – 250 kWh per month. Making your own power Off-Grid requires a number of bits and pieces: First you need a source of energy. This can be solar PV, wind energy, hydro (water) power, bio-gas, a generator etc. (or a combination of several of these). These days the focus is generally on solar panels as the main source of energy, since those have become relatively affordable, are extremely reliable, and we can predict very accurately how much energy they will produce. Usually there is a generator as well, to provide backup power in case of long periods without sufficient sun (sizing for 100% coverage through renewable sources is cost-prohibitive). Solar panels are usually grouped together in “strings” and a number of strings is combined together. That is the job of the combiner box. Depending on the size of the solar array there may be one or more combiners. The combiner boxes connect to one or more charge controllers. Those charge controllers take care of converting the solar panel Voltage to the battery Voltage, and they charge the batteries just right to get the best longevity out of them. An important job of the charge controllers is also to stop charging the batteries when they are full. The batteries store energy so it is readily available any time you flip a switch in the house, or the refrigerator decides it needs to run, or the furnace blower motor kicks in etc. The sun does not always shine (the nights being one such time), and even when it shines its intensity varies. That is the reason why we cannot power the appliances directly from the solar panels, the batteries are there as a buffer, supplying energy at the rate that is needed regardless of what is coming in from the charging sources. The batteries are DC Voltage, usually 12V (for very small systems), 24V (used for small-to-medium sized systems), or 48V (most used these days). There are DC appliances and lights, but for the most part your appliances all require 120 Volt AC, and sometimes even 240 Volt AC. That means we have to convert the battery Voltage into 120V AC, to “invert” DC to AC, and that is where the inverter comes in. The inverter takes DC battery Voltage, making a mini local AC grid for all your appliances. The AC output of the inverter is simply connected to your regular breaker panel, powering all the regular house loads through the breaker panel. The illustration on the right should help clarify this as well. Those are the major components involved in an Off-Grid system. There are some ancillary items, such as a controller for the inverter, a meter to show what is happening with the batteries, breakers of varying sizes etc. What Changes Are Needed To Go Off-Grid? There is no upper (or lower) limit to an Off-Grid system, you can make them as big or as small as you like! However, the up-front expense in practice dictates an upper limit of around 300 kWh per month for a whole-house installation. That may seem to be very little energy use, especially in comparison to the average Canadian grid-tied household that uses 1000 kWh. For those coming from a grid-tied existence some changes will therefore be needed. Remarkably it does not take all that much effort to reach the 300 kWh per month limit and live pretty much the same as one would on-grid. The electrical clothes drier needs to be replaced with a propane unit (or better yet, with an outside clothes line!). Energy efficient appliances need to be used, in particular for the refrigerator and the blower motor in case of forced-air heating. Also, having a dedicated (chest-style) freezer is difficult Off-Grid, since those are notorious energy hogs. Lastly, running a central air-conditioner is problematic; not so much because of lack of energy, since A/C is used in summer there’s generally plenty of that, but because of the increase in system size to run it and the expense this dictates. Then there are some common-sense items, such as using energy efficient CFL or LED lights, energy-star appliances etc. Overall, the required changes are remarkably few though. Besides those changes, a somewhat more energy-aware life-style is very helpful as well. While much of the time it is life as usual, when it comes to energy intensive tasks such as three loads of laundry, it means taking a look at the state-of-charge of the batteries, and the weather forecast with regard to sunshine for that day and the next. In general, it is easier to take a new house Off-Grid than it is to retrofit an existing building. This is because appliances and life-style in an existing on-grid building are often so energy inefficient that change is difficult or expensive at that point. Still, that should not hold you back from talking to us if you are serious about taking your house off the grid. Where there is a will, there generally is a way! There is not much maintenance involved in an Off-Grid system. In winter snow should be kept off the solar panels. Ideally, for an Off-Grid system, it is better to place those on a ground-mounted racking systems at a 60-degree angle, so snow tends to fall off on its own. Also, once a month the batteries should be checked (for regular deep-cycle flooded lead-acid batteries, the type most often installed). Checking the batteries involves topping up the fluid level with distilled water if needed, and writing down the specific gravity in a log to track changes and head off any problems with battery cells (not to worry, we can tell you how to do this). In all, an hour a month should do the job. Each kilo-Watt of solar PV modules in our area (Ottawa, Ontario) will produce just about 2.66 kWh per average day from late spring through early fall, when mounted facing south at a 30-degree tilt angle. That same kilo-Watt of solar will produce around 1.33 kWh per average day in the middle of winter, when mounted at a 60-degree tilt angle and kept snow free. If those same solar panels are mounted at a 30-degree tilt angle in winter, they will only produce about 1.08 kWh per day when kept free of snow (not easy at that angle), a 20% loss vs. 60-degree tilt. That should explain why we like to ground mount Off-Grid solar panels on variable-tilt frames. 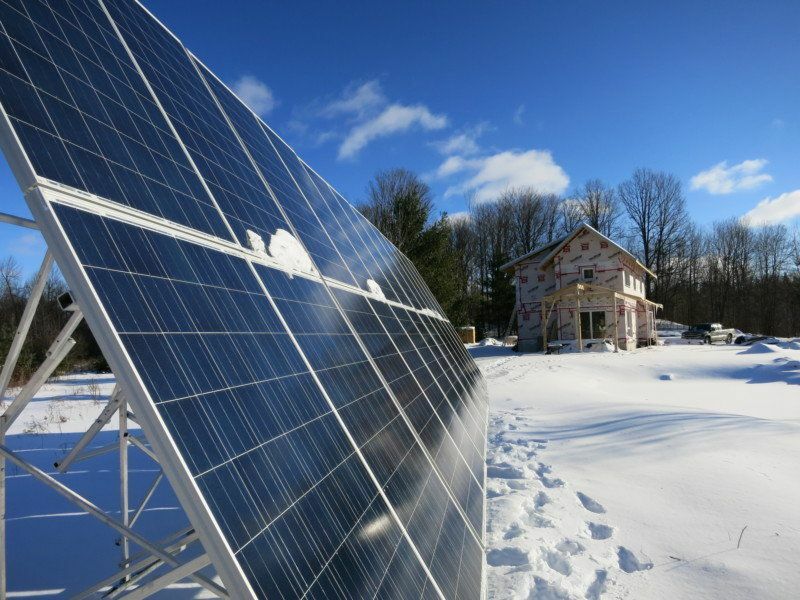 It is the winter that determines the system size and at 60-degree tilt you get the most out of the panels, while making it easy to keep the snow off. On the energy storage side, we like to design for 3 days of autonomy (no energy input from the solar panels). For those that live Off-Grid every day of the year, systems are designed for winter. From the information above, each kW of solar panels produces 1.33 kWh per day, and three days of that means we need to store 4 kWh. Lead-acid batteries are normally discharged to 50% Depth-Of-Discharge (DOD), they can be discharged to 80% DOD in a pinch without any problem, but for best longevity the design rate is 50% DOD. That means we need 8 kWh of energy stored in those batteries for each kW of solar panels, and for a 48 Volt battery system that works out to 167 Ah of battery capacity for each kW of solar panels. Battery banks can be made larger if more autonomy, or less dependency on a generator in winter, is required. However, the solar array should be upsized too in that case. Otherwise it just takes too long to (re)charge the batteries back up in winter, leaving them sitting less-then-full for too long. The 3 day autonomy is a good trade-off between cost and the need to run a generator in winter. The last piece of the puzzle are the energy and power needs of your Off-Grid residence. This is normally done by going over every room to determine how many kWh’s of electricity are needed in winter and summer, and what is likely to be switched on at the same time (this determines the inverter size). We can help you with a spreadsheet that makes adding up those loads easy. With that information the system can be sized properly, and all the components determined. To make it easier, all this information has been put in a table, with monthly (winter) energy use numbers, and a (very) approximate price of parts. Please do not read too much into this price; every case is different, and component prices constantly change. Certain additional costs (such as concrete foundations for ground-mounted racking, and a generator) are not included either. It is meant to give you a general idea, nothing more. Note: Cost does not included GST/HST. Monthly energy production is mid-winter, PV modules mounted at 60-degree tilt-angle. Battery bank size is for a 48 Volt DC system. The table shows pretty substantial whole-house Off-Grid systems, meant to be very reliable, such as a family living Off-Grid. The parts pricing reflects that; it assumes Magnum inverters, MidNite Solar charge controllers, and Surrette batteries. This is a very large step up from our Cottage Kits, and while those work fine for a cottage where ultimate reliability is not a requirement, they are not recommended for people that need to depend on having power 24x7x365. We can of course also help you with a much simpler two or three panel cottage system, and that would cost far less. Just contact us and let us know what you need! If you are reading about DIY Off-Grid systems you may also interested in our articles about MicroFIT and Net-Metering. Those are the two grid-tie solar PV options for Ontario (Net-Metering is available in all Canadian provinces).